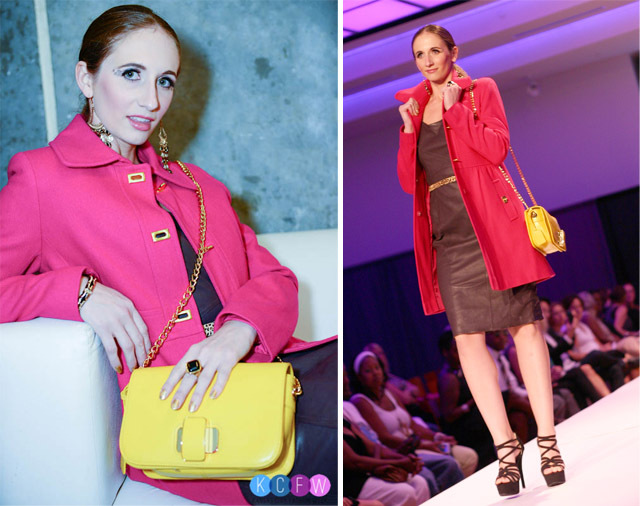 I had the extreme pleasure and fun opportunity to style 4 models from head to toe for the first night of Kansas City Fashion Week (KCFW) Saks Fifth Avenue Off 5th runway show. I styled them with current in-store merchandise and Fall looks. I had a blast with my models and wanted to show a variety of Fall outfits. Keep reading for details on each model and their outfits! Meet Tina. I knew the instant I met her we were going to have fun! She was up for anything and so we went playful. 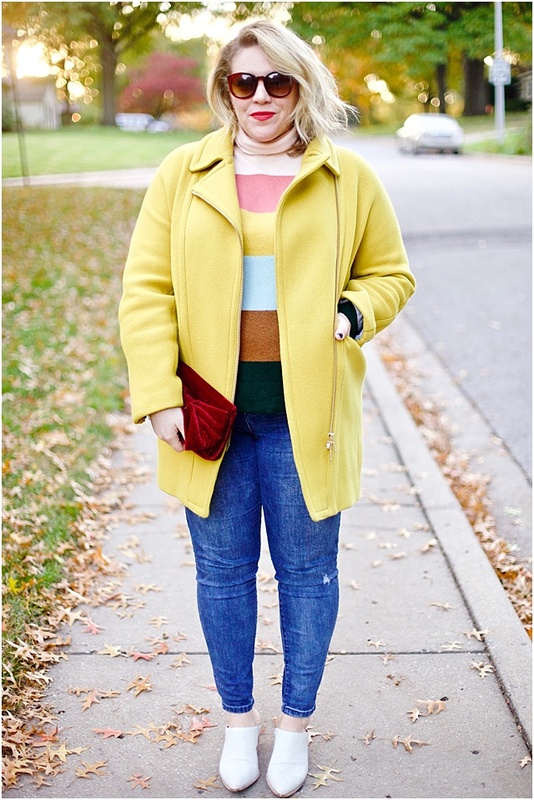 I wanted to keep her outfit bold, bright and spunky - just like her! Her bright fuchsia dress is by Ellen Tracy (similar). I chose a moto faux-leather jacket in teal jacket (similar) to keep the look playful. Meet Arika. I pulled an outfit blindly for Miss Arika (based off measurements) and couldn't be happier with how it turned out. 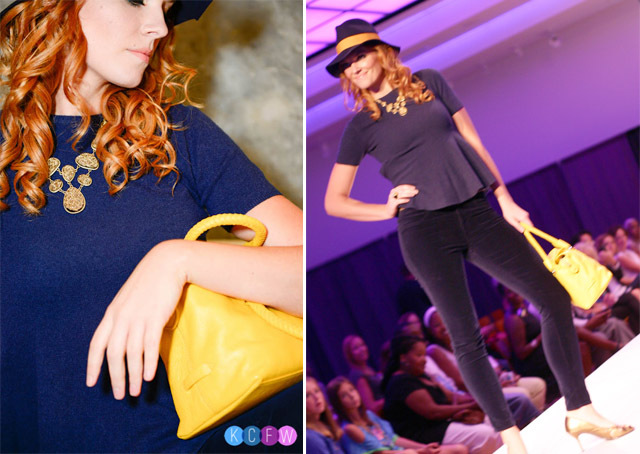 She rocked this all navy look with pops of mustard yellow. Her skin tone and hair worked beautifully with navy and if this girl isn't meant to wear hats, I don't know who is. This outfit was meant to be sweet and sleek and I think it came together so well. Her peplum sweater top is by Stella McCartney (similar or similar), Velvet skinny jeans by J Brand (similar), Yellow bag is Badgley Mischka (similar for less). Meet Joel. What a trooper, this guy! He just went with the flow (as choppy as it was) and was so laid back, he'd be any stylists dream male model! I wanted to keep his look layered, casual and cool. 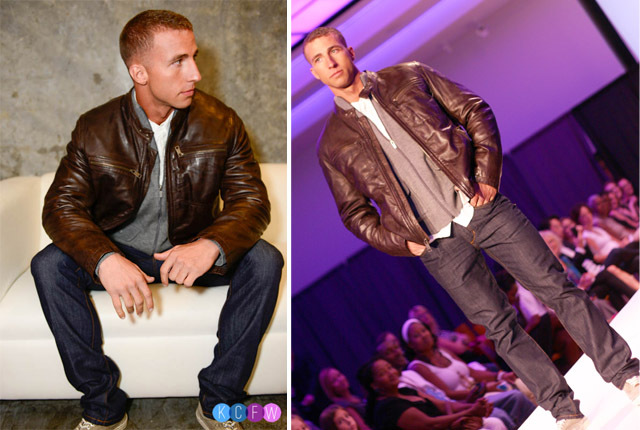 Leather jacket is by Michael Kors (similar) and definitely wanted to display my love for Fall layering underneath it with a casual white button down shirt and gray sweater zip up (similar) on top of that. Meet Holly. She had this very polished, sleek and calm feel to her the minute I met her. I just had to put her in an all leather dress that screams put-together. Leather is on my mind (can you tell) and I felt this dress would transition perfectly from the office to happy hour. 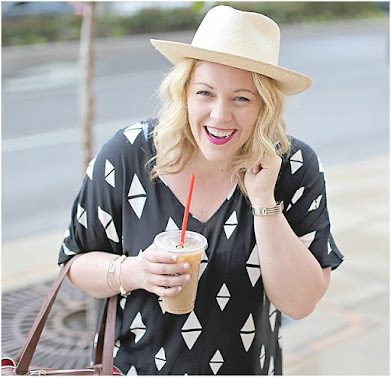 Dress for less, similar style here. Great burgundy leather dress here. Similar coat for under $70! Looks fun, huh? And tonight will be fun, too! It's not too late to grab tickets (which is also benefiting Wayside Waifs) for tonight's red carpet event downtown at The Gallery, where you can sip on some Kansas Clean Distilled Whiskey cocktails and watch amazing designers debut their Spring collections. See more pics from behind the scenes and more runways on my Facebook page!